ALBANY, NY (WSKG) – Democratic candidate for governor and actor Cynthia Nixon came to the Capitol to talk about the need for more education aid and what she says are Gov. Andrew Cuomo’s failings in that policy area. Meanwhile, Cuomo’s campaign said it’s Nixon who is being inconsistent. Nixon spoke before the Small City School Districts association, a group that’s suing the state to obey a 2007 court order that said billions more need to be spent on the state’s schools. “Point of fact, New York is the second-most unequal state when it comes to school funding,” said Nixon, who added there’s a $10,000 gap between funding for pupils in the state’s wealthiest schools versus those in the state’s poorest schools. 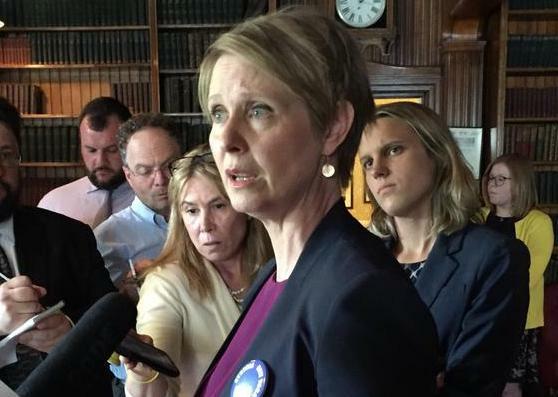 Nixon said the Cuomo campaign charges are “100 percent untrue.” Earlier in the spring, she said the governor’s self-imposed state spending cap was “disastrous” but said she’s never outright opposed the tax cap. She said the tax cap rules need to be eased, though, to make it less difficult for schools and municipalities to override the cap if they believe it’s necessary. Nixon said the state needs to take over a greater share of school funding and the state Medicaid health care program so that districts and local government don’t have to collect high taxes to pay for them. Cuomo was in Albany but did not appear in public. He called in to the cable news channel New York 1, where he agreed that there is inequity in school funding in New York. The governor said he needs to know more, though, about how much each school district is spending on each school. Nixon said Cuomo often says the state spends more money than any other state. Nixon is also pushing for higher taxes on the state’s millionaires to get more money for schools and other priority items, like the subway system. Cuomo, on New York 1, said that’s a “non-starter” with the Legislature and the votes are not there. The governor said he supports congestion pricing to fund mass transit. Nixon said she thinks if new Democratic lawmakers are elected in November, the millionaires’ tax could pass, and she said many Democrats already in the Senate and state Assembly support it.